BCATestPrep.com provides a free trial period with every subscription. If you are unhappy with the service for any reason cancel within the first 5 days and receive a full refund. ** We want you to be comfortable proceeding at your own pace and without risk because we truly believe BCATestPrep.com is the best value for many students intent on preparing for the Bergen Academies admission exam. In addition, we offer a limited number of Free Level exams available on an unlimited basis. **The free trial period does not apply within two weeks of any testing date. How do I purchase and is it secure? You can purchase the service from your member accounts page if you are a registered user or feel free to follow the Get Started button on any of the main pages to purchase the plan of your choosing. You will be redirected to PayPal for secure payment by credit card or with your PayPal account including features like Bill Me Later. Afterward you will have the option to be redirected back to BCATestPrep.com at which point you will be notified that you are leaving the security of PayPal’s site and returning to general internet browsing. Each paid membership plan includes access to all areas of the site except special live classroom tutorials. Pricing plans vary from monthly to annual (the best value) and cost a few bucks more than a test prep book or about the cost of a single session with a tutor. Absolutely not. Even though you must click the PayPal button to be redirected to secure payment via PayPal you will then be able to pay by credit card or any various options provided by PayPal. The only restriction is for recurring plans like Monthly or Quarterly where a PayPal account will be required. Feel free to cancel at anytime from your Member Account page. It is that easy and if you have a recurring plan feel free to enjoy the service for the remainder of your service period. We are confident you will find BCATestPrep.com one of the highest quality, most comprehensive preparation programs offered for the Bergen Academies admission exam. Under the home page menu there is a link to Contact Us where you can submit online tickets to discuss any questions or possible concerns you may have. In addition, we have recently added phone support during business hours. What are the success rates of students taking your course? As you know, entrance into Bergen Academies is based in large part on your exam results in addition to an interview. It is a competitive process and the admissions rate is below 20%. It is a simple fact that most students will not gain entrance. That said, we enjoy a success rate far above the average and offer you the opportunity to practice with real BCA exams. By comparison, the SHSAT exam for NYC specialized high schools has similar overall acceptance rates around 20% and admissions is determined exclusively by exam score. The success rate of some of the best, high priced tutoring courses ranges between 41% and 46%. Over 70% of students who completed our full course achieved scores exceeding the admissions cut-off. That’s right! More of our students who spent about $50 and put in the effort performed above the students next to them that spent $2,000 and upward for tutoring and several times better than the overall test pool. We see no reason why our success rates for Bergen Academies would be any less. Although the website is designed to work on most any device including tablets and smart phones, it is best you study and take tests at a desk using a PC or laptop with ample screen size and high bandwidth access to the internet. Like any test or study course you will want to take notes and be comfortable and focused while working. The service is tested on recent versions of Chrome, Safari, and Firefox, but is not limited to those browsers. It is optimized for Google Chrome so we recommend you utilize the most recent version for best performance. Do I get a single user login with membership? Yes. You are provided with a single user login and you will be able to select the Username and Password. We suggest you select a strong password and an anonymous username especially if you interact in our essay or Q&A forums. It is against the membership rules to share that login. A simultaneous login will bounce the original users from the website and any unusual IP activity may also result in users being bounced from the site. Also, among our many exams and problem sets, certain exams will also be available only a limited number of times so please respect the rules. What are the rules of membership? Membership entitles a single user access to our website. To the extent you contribute in the question and answer forums or essay sections of the website, we ask that you respect all other parties. It is against the rules to curse or intimidate any other online member and that will be cause for immediate cancellation of your membership without refund in addition to any other remedies applicable under law. Everyone, regardless of background and skill level, participates on the site with a positive effort to improve their performance on the exam. Please keep that in mind and help make it a positive learning experience for all. I just purchased membership, but I am not getting access to member pages. Most often a simple refresh of your browser will override your local browser caching and permit access to our dynamic exam pages. If that is insufficient, try clearing your browser cache or log out and log back in and you should see the member pages. I see a message "Blocked Plug-In" instead of the video that is supposed to play on the site. ‘Blocked Plug-In’ messages can occur for users of Apple’s Safari browser who are running out of date versions of the Flash Player plug-in. A recent Apple advisory indicates Safari will block out of date versions of Flash Player. The solution to this problem is to navigate the internet to Adobe’s free download page for Flash Player and update your version at no cost. How do I navigate to my account page? It is easy and quick to reset your password if you follow the directions below. 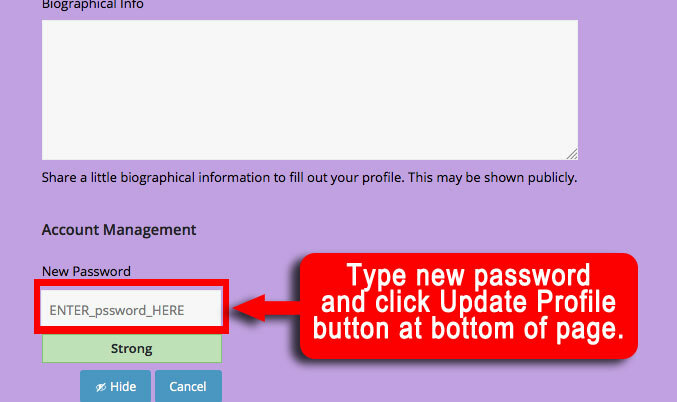 We have recently updated and simplified the password reset option. Navigate to your Member Accounts page from the main menu Home>Membership Accounts. Click the blue link to Change Password. The following page will permit you to modify various details including your password as shown below. 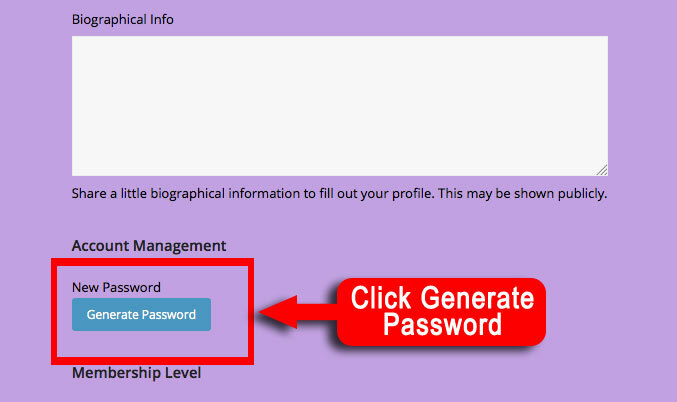 In the Account Management section click the Generate New Password button. 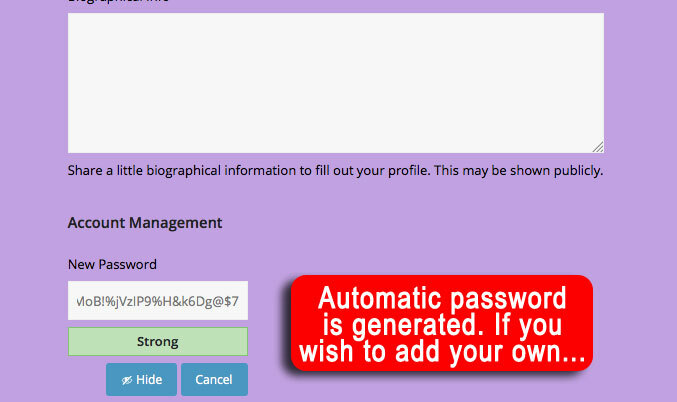 A new password will be generated, but you have the option to type your own password in the same input box. Type your new password in the input box shown “ENTER_pssword_HERE”. Scroll down and select Update Profile at the bottom of the page and you will receive a notice that your Profile is Changed. Your new password will be active. See screen shots below.